This extension show QR code with link to this (opened) page on all pages. Works with both SEO URLs and normal URLs. Extension can work with all themes (with almost all themes will work right after install). Supported versions of OpenCart: -.. 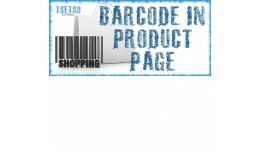 This extension allows the addition of barcode on product page. When you add UPC, EAN, JAN or ISBN code in admin, barcode will be appears over the Reward Points in product page. You can use more than one type of barcode (for example EAN and ISBN)..